Schematic of the solvent range for partition systems. 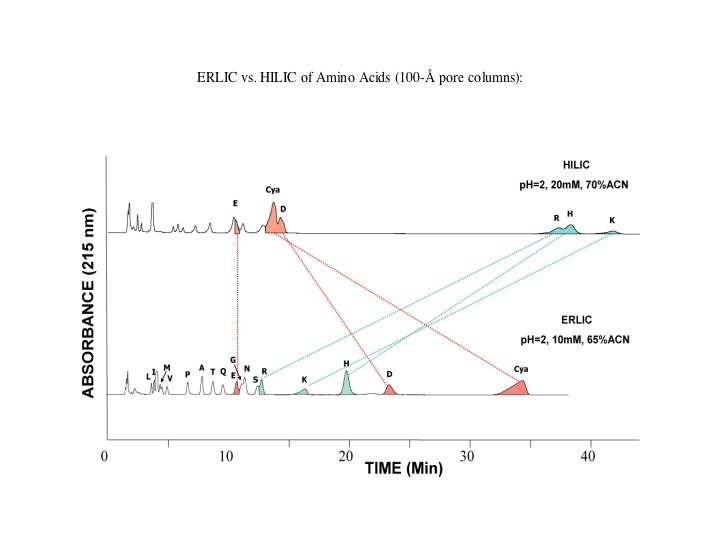 HILIC is primarily a partition system which is useful for the retention and separation of polar analytes with neutral to negative distribution coefficients (LogD values) for both charged and uncharged species, or partition coefficients (LogP values) of uncharged species. Schematic of the polarity range for effective HILIC separations. ERLIC (also called eHILIC and Ion-Pair Normal Phase) is a subset of HILIC separations which employs charged interactions and their subsequent Orientation Effects. A charged functional group on a column's surface's chemistry has an order of magnitude greater free energy of interaction than that of an uncharged analyte. With less than 20mM buffer (in this case 12.5mM) final concentration, the negative charge of the ZIC column is not sufficiently shielded, resulting in a repulsion of the negatively charged phosphates. The remaining neutral polar functional groups then partition into the bound water layer by polar interactions as outlined in the previous figure. The degree of retention is a function of the amount of organic solvent in the mobile phase. Without the negative surface chemistry to orient the analytes, the phosphate groups would dominate the separation, minimizing the remaining polar differences which were of interest in this application. 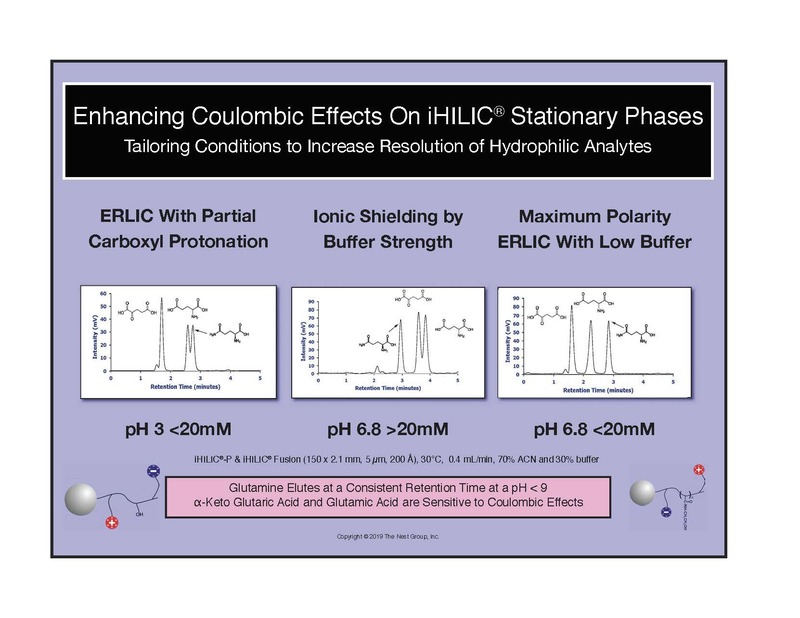 Selectivity changes in HILIC using similarly charged organic acids to probe the effects of pH and coulombic interaction for ionic HILIC phases. When trying to suppress the ionization of carboxyls, it is important to remember that functional groups alpha to a carboxyl can lower its pKa to 2.2 - 2.4 from that of a sidechain carboxyl, pKa 4.2. 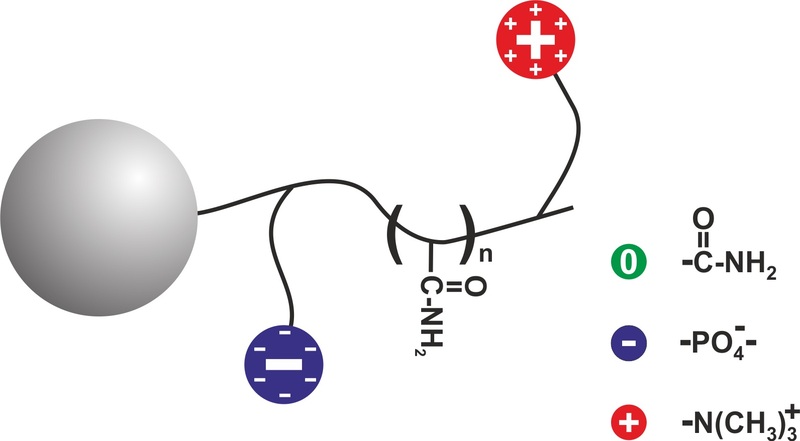 Thus a mobile phase at pH 3.0 might not ion suppress all carboxyls, and will allow electrostatic repulsion or attactraction to an ionic, HILIC stationary phase. 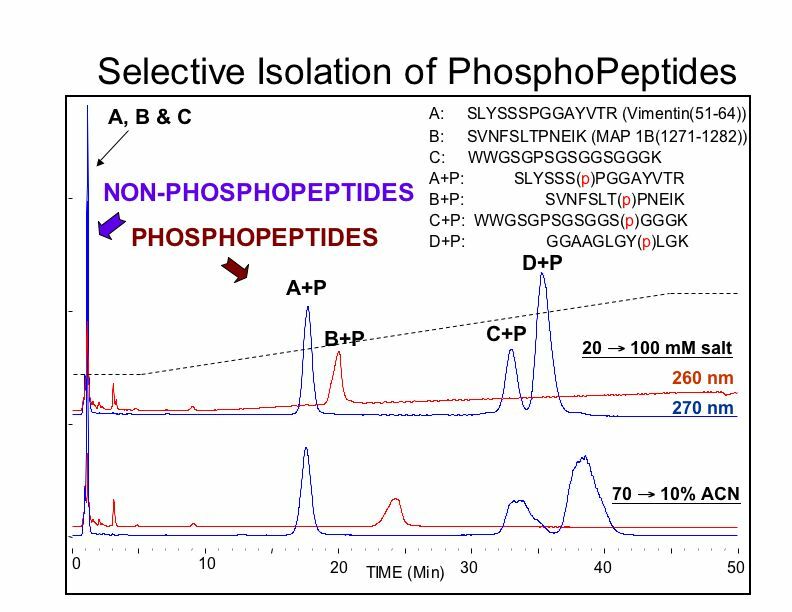 2) Phosphopeptides can be isolated selectively from tryptic digests and separated with high resolution. 3) Phospholipid-glycopeptides can be separated with high resolution of the glycopeptide portion. 4) Phosphonyl antibiotic mixtures can be resolved based on the non-phosphorylated portion of the molecule. 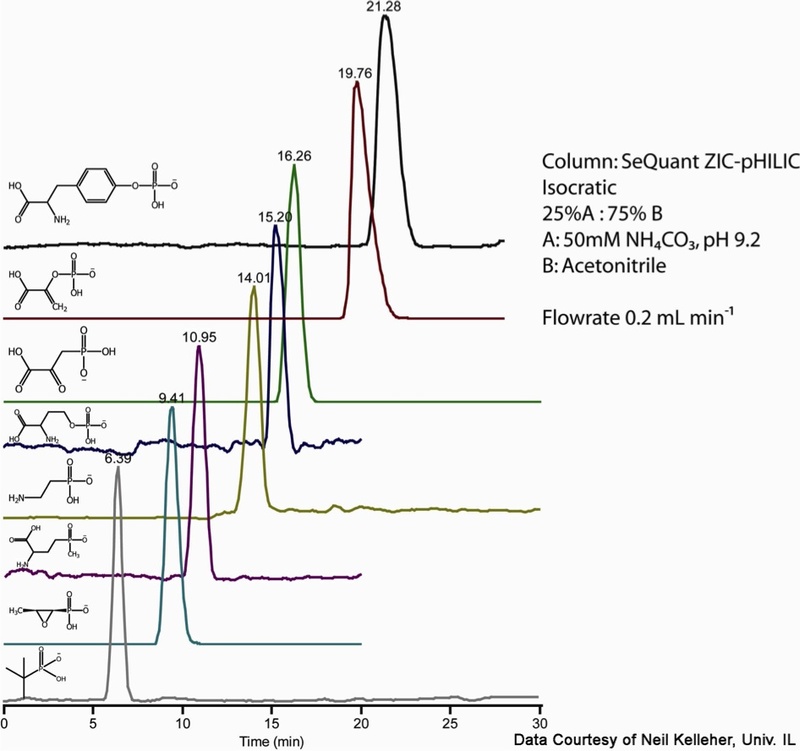 Ionizable biochemicals with a high charge are generally significantly better retained in chromatography than compounds of low charge (e.g. ATP vs. AMP), and those charges tend to dominate the mode of interaction with the surface chemistry to the detriment of other functional groups. This is true in both ion-exchange and hydrophilic interaction chromatography (HILIC). A gradient is necessary to make both types of compounds elute in the same time frame. However, if HILIC is performed using an ion-exchange column of the same charge as the most highly-charged functional groups, then their retention is selectively antagonized by electrostatic repulsion (ERLIC). This permits their elution in the same time frame as less highly-charged compounds using isocratic conditions, or with lower amounts of buffer, and it allows the chromatography to enhance the presence of oppositely charged or neutral polar functional groups within the molecule. The polarity of the surface chemistry of the PolyHYDROXYETHYL A™ column ( poly-2-hydroxyethyl aspartamide) is modifiable by pH. In this respect it is analogous to a weak ion exchange chemistry, where elution can be effected by either a pH change or by solvent polarity (buffer strength or organic solvent content). By selecting a pH of 2.7, 4.4 or 6.5 one can select a surface polarity which can compliment the polarity of the functional group in one's molecule to enhance selectivity. 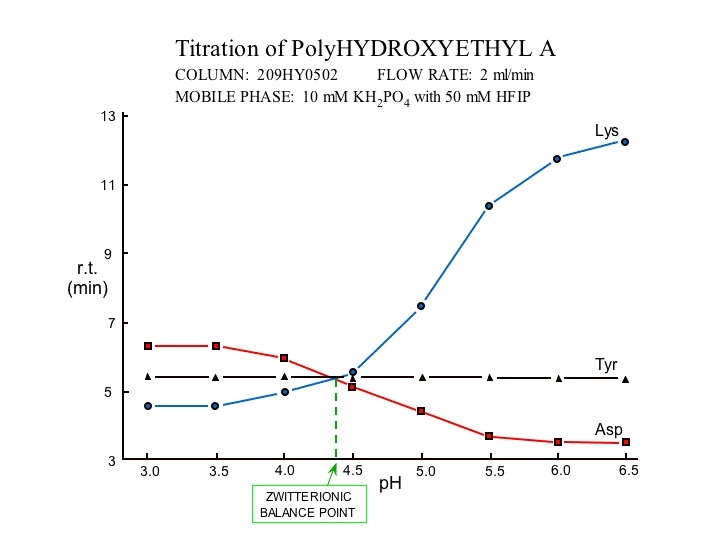 In contradistinction to the PolyHYDROXYETHYL A, the zwitterionic, ZIC®-HILIC, and the inverted zwitterion, ZIC®-cHILIC, stationary phases maintain their charge over a wider pH range, analogous to a strong ion exchange chemistry. This provides a stable surface chemistry against which the polarity of the analytes alone can be modified, when trying to affect selectivity by operating at different pH's. Schematic illustation of the zwitterionic, ZIC-HILIC, betain sulfonate stationary phase. Schematic illustation of the inverted zwitterionic, ZIC-cHILIC, cholinate stationary phase. A chemical extention of both the hydroxyethyl amide and ZIC® chemistries, iHILIC® FUSION® & FUSION(+), offer features of both of the above approaches. The result is exceptional resolution and stability for metabolomic and epimeric small molecule separations, using either low molarity (ca. 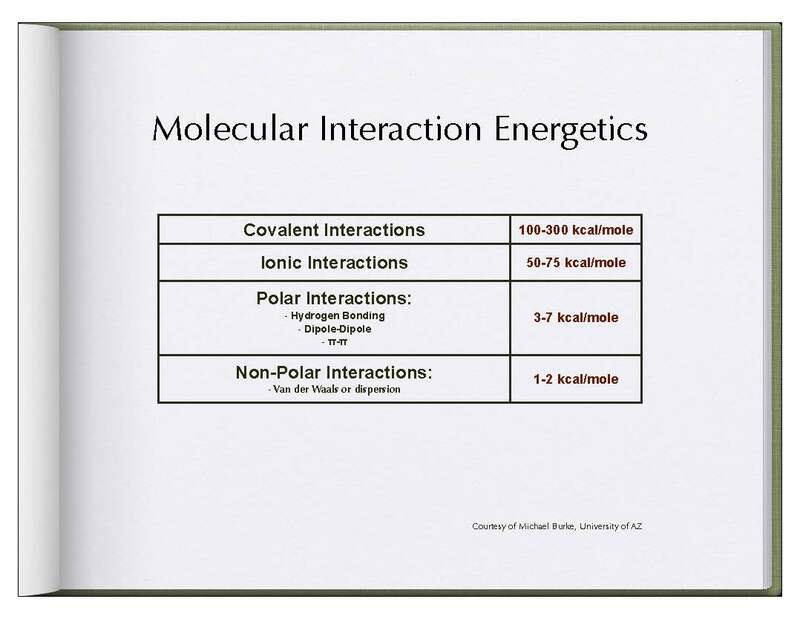 5mM) to enhance ionic interactions or high molarity (ca. 50mM) to utilize the high polarity of the phases. Schematic illustation of the slightly negative, iHILIC® FUSION® stationary phase. Schematic illustation of the slightly positive, iHILIC® FUSION(+)® stationary phase. 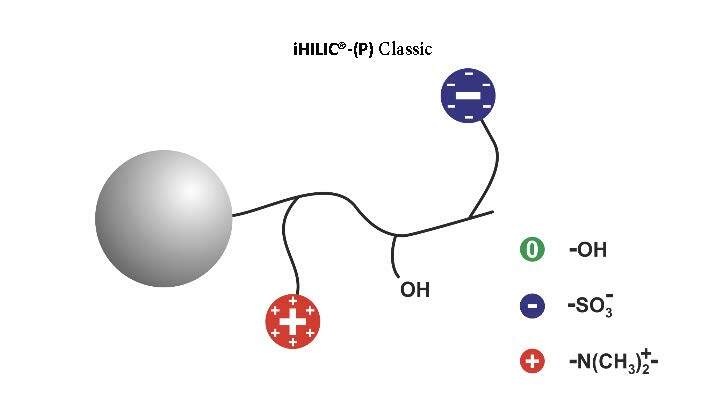 The iHILIC® chemistry is also available on a polymeric bead, FUSION(P)®. Or for lower buffer in the mobile phase, on a diol polymer, charge balanced (i.e. zwitterionic) phase, iHILIC®-(P) Classic. Both are capable of running at pH to 9.4, to reduce the dominance of amino groups for organic acid separations. Schematic illustation of the iHILIC® FUSION(P)® stationary phase. 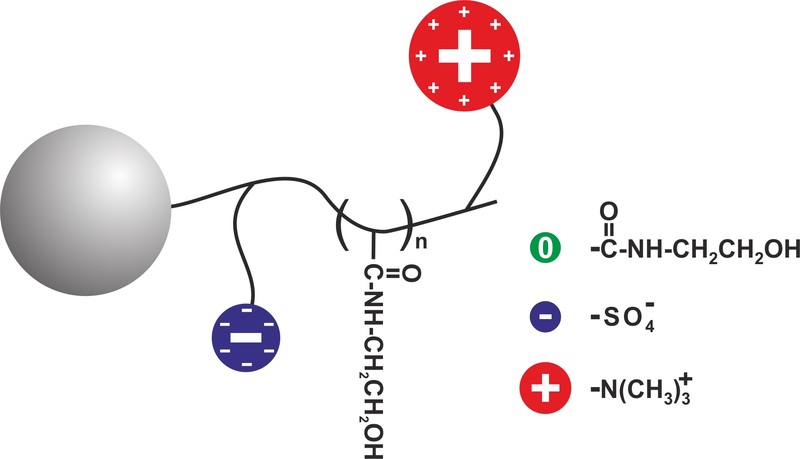 Schematic illustation of the low buffer, diol polymer, charge balanced (i.e. zwitterionic), iHILIC®-(P) Classic stationary phase. Amino acids, peptides and proteins: The most polar groups in this family of molecules are the basic, amino residues. If ERLIC is performed using a column with an amine functional group, an anion-exchange column (e.g., PolyWAX LP™) at a pH ~ 2.0 (low enough for carboxyl groups to lose their negative charge), then amino acids, peptides and proteins will have a net positive charge and will thus experience some degree of electrostatic repulsion. The most basic compounds, normally the best-retained in HILIC, experience the most repulsion in ERLIC. Nucleotides and nucleic acids: If ERLIC is performed with a negatively charged surface chemistry, a cation-exchange column (e.g. PolySULFOETHYL A™) with TEAP buffer at a pH < 3.5, a pH at which phosphate groups have just a single negative charge [note: electrostatic repulsion is too great at a higher pH where phosphate groups acquire a second negative charge], then the long eluting tri-phosphates can be eluted with significantly less buffer (even as little as 10mM). Use of triethylamine methyl phosphonate buffer salts (which aren't volatile either), significantly increases the retention of tri-phosphorylated species vs. triethylamine phosphate. While a HILIC separation of these molecules is possible using a gradient, it requires up to 250mM ammonium acetate to elute the tri-phosphates, and the phosphate groups dominate the separation order. However, with the use of a polymer based, zwitterionic, HILIC chemistry (iHILIC® Fusion(P)) at a pH nearer the pKa of the amine of the surface, a more negative surface chemistry is formed. 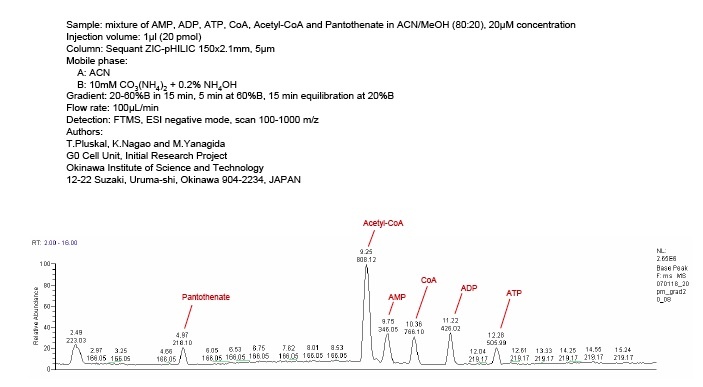 This permits a similar Adenosine Phosphate analysis (AMP, ADP, ATP, CoA, Acetyl-CoA, and Pantothenate) using gradient ERLIC LC/MS conditions, but with volatile buffers (80% ACN, 20% 10 mM Ammonium Carbonate, 0.2% NH4OH). At pH 2.0, phosphate groups in peptides retain some of their negative charge. This does not permit the isolation by anion-exchange chromatography of singlely phosphorylated peptides from tryptic digests, since the electrostatic attraction is not sufficient to overcome the electrostatic repulsion from the N-terminus and the C-terminal Lys- or Arg- residue toward the basic functional groups of the column. However, phosphate residues are quite hydrophilic. 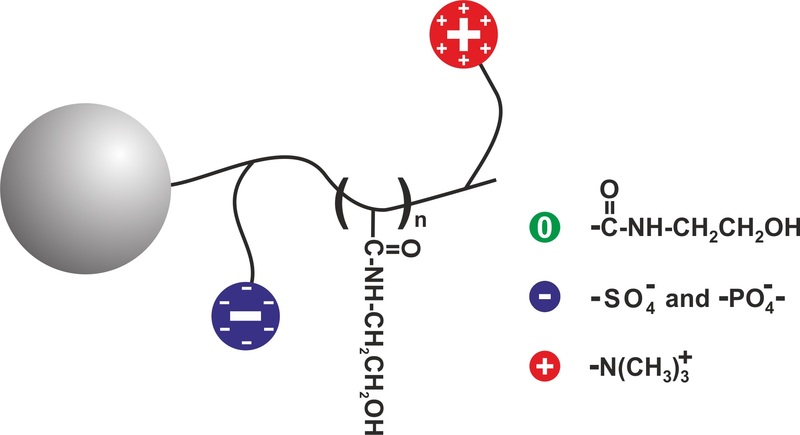 In the eHLIC mode, the combination of electrostatic attraction and hydrophilic interaction suffices to pull singly phosphorylated peptides away from the non-phosphorylated peptides in tryptic digests, at pH 2. Also, unlike the situation with high-affinity media such as IMAC or titania, the phosphopeptides are well-resolved from each other. This permits their convenient separation into numerous fractions, an important tool in phosphoproteomics for identifying the sequences of thousands of phosphopeptides from a single sample. Tryptic Digest of ß-Casein using an anion exchange column, PolyWAX LP (100x4.6-mm, 5-µm, 300-Å, P104WX0503) in both the ERLIC and IEX mode. 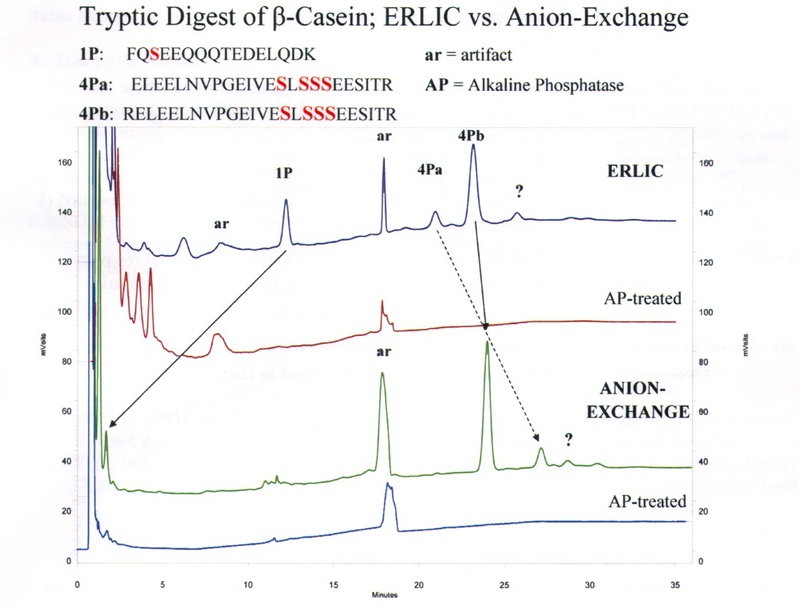 Note the poor retention of the singly phosphorylated fragment in the anion-exchange mode, above. 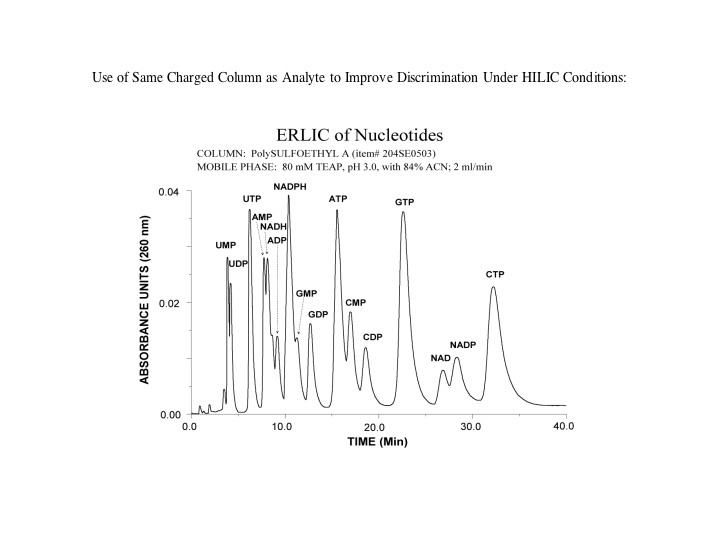 ERLIC separation of phospho-peptides from HeLa cells using a PolyWAX LP column, P104WX0503. It should be noted that the recovery of phosphopeptides is highest if low-salt fractions are desalted with HyperCarb® media and high-salt fractions are desalted using RPC, C-18 media. 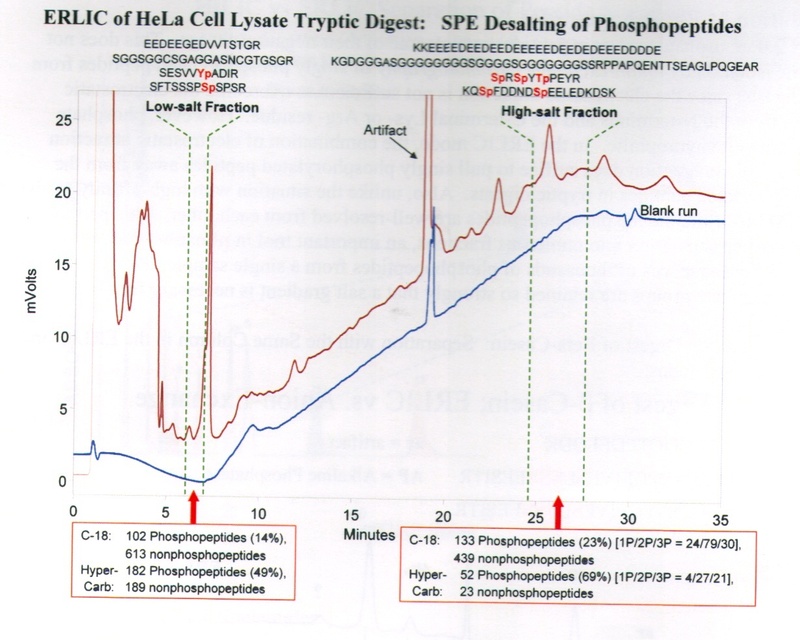 Use of an SCX chemistry (e.g., PolySULFOETHYL A™) for fractionation of a tryptic digest of a phosphorylated protein can segregate the phosphorylated peptides. They elute at the beginning of the gradient, while the high capacity SCX column holds up the more positively charged species. Take care to lyophillize the ammonium bicarbonate two to three times with methanol to reduce the buffer-salt content of the sample, otherwise doubly charged peptides can contaminate these single charged peptides in the first fraction. 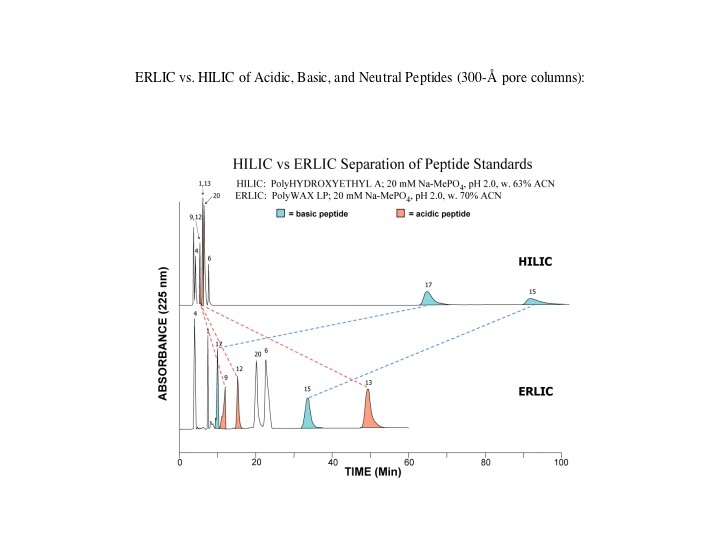 Comparison of SCX, TiO, HILIC (HEA) and HILIC (WAX) for phosphopeptide segregation and/or fractionation shows the value of ERLIC surfaces for reducing the amount of buffer necessary for eluting phosphopeptides compared to using other HILIC surface chemistries. Comparison of SCX and ERLIC phospho enrichment strategies. Kehasse, A., et al., Boston University School of Medicine, ASMS-2011 Poster. "Simultaneous Identification of Unmodified Tryptic Peptides, Phosphopeptides, Glycopeptides, and Deamidated Peptides" (2011 ASMS, Siu Kwan Sze Poster, Nanyang Technological University, Singapore).